Hyperbole and a Half: It's Game Time! Vote For the Winner! I challenged my fellow blogger, Kaloo, to a duel. The idea is that our readers will vote for which of the following MS paint creatures would win in a battle to the death. This week we have Fire-breathing Spiky Unicorn versus Kung Fu Chicken. When voting, please take into account each creature's strength, agility, size, intelligence, special powers and basic awesomeness. Okay. The power is in your hands now. Will it be Kung Fu Chicken or Fire-breathing Spiky Unicorn? Go! I'm reading: It's Game Time! Vote For the Winner!Tweet this! Ahem. As the other person... I totally understand Duncan. As the creator of the Kung Fu Chicken, I refrain from voting of course. Well, 'what for' I say. I say Kung Fu Chicken all the way. I'd love to comment and vote about these drawings, but I've been stunned into silence by the fact that people still have MS Paint, much less still use it. Ha! As if there is even a question. Unicorn. Duh. hmmm, everyone knows unicorns dont exist so it would have to be the kung pao chicken. Kung Fu Chicken all the way. He's gonna break that unicorn in half so he can get to the other side. The chicken would totally win because the unicorn would refuse to fight. Unicorns are kind and even if one could breathe fire, he would probably use it to stop a burgler or start a campfire for a cold homeless man instead of hurting a chicken. On the other hand, chickens are devious and sneaky. Kung Fu chicken would feel no qualms about taking down a unicorn even if it was the last one on earth. Unicorn has the genetic advantage here as both mass and muscle size are larger. 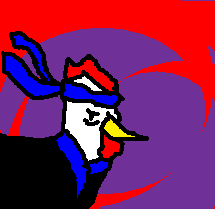 Due to its long hours of flexibility training in the dojo and larger ratio of cartilage to bone, the edge here clearly goes to Kung Fu Chicken. You would think that Unicorn would win here but YOU WOULD BE WRONG! Notice, Grasshopper, how all of the Spiky Unicorn fits into the box while only the Kung Fu Chicken's massive head and shoulders can be seen in an almost identical viewing surface. That is one big chicken! The eyes give this one away. Kung Fu Chicken has a deep, soulful look about him, but wait! Spiky Unicorn has his/her eyes wide open because he/she recognizes the seriousness of the fight and is taking in the entire surrounding, ready for anything. For not resorting to petty psych-outs, Unicorn has the edge. Both creatures are awesome, but the edge goes to Kung Fu Chicken for living in a world of colored swirls. I think it's obvious who would win this duel to the death. 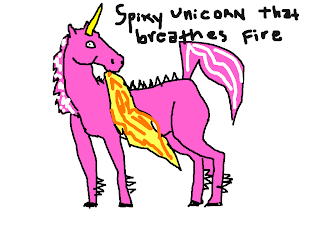 Spiky fire breathing unicorn, of course! Not only is the unicorn larger, but the initials to Kung fu Chicken is "KFC", and the unicorn can breathe fire.